#211, St.91K, Phum Chamka ovlek, Sangkat Kakap, Khan Posenchey, Phnom Penh, Cambodia, Phnom Penh, Cambodia. The Phnom Penh Center for Independent Living (PPCIL) is a Cambodian non-governmental organization established in 2009 which was founded by Cambodians with disabilities led by Mr. Mey Samith who completed the training program titled Duskin Leadership Training in Japan; a Program for Persons with Disabilities in Asia and the Pacific Region, in 2007. Samith wanted to share what he had learned in Japan with his friends and so established the first Independent Living Center in Cambodia. PPCIL was officially registered at the Ministry of the Interior of the Royal Government of Cambodia on September 23, 2009. PPCIL promotes a rights based approach to disability and development aimed at empowering PWDs through the independent living movement. PPCIL has been working to provide Persona Assistant Service free of charge to assist persons with severe disabilities and conduct an advocacy campaign to demand the full equality for PWDs by cooperating with local authorities, national and international organizations. PPCIL also has experiences in transferring knowledge to community stakeholders, particularly, sharing with local authorities, public schools, universities on concepts of disability, independent living and social inclusion development. PPCIL plans to set up independent living group (ILG) networks that are linked to local, national DPOs and PPCIL staff, volunteers and parents to help address issues related to persons with severe disabilities, disability rights and responsibilities by engaging with families and communities, local government partners and advocating disability rights through national forums. 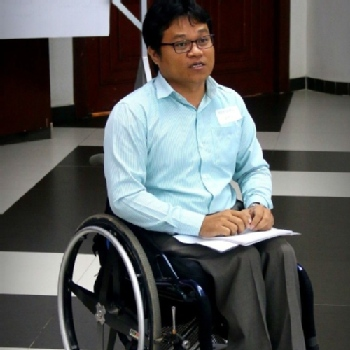 We at Phnom Penh Center for Independent Living (PPCIL) would love to hear from you!